As most readers will know, Before Midnight is the third installment in Richard Linklater’s (ongoing…?) series of films that began with 1995’s Before Sunrise, and continued with 2004’s Before Sunset. 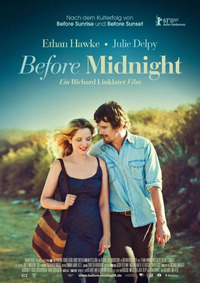 This latest entry, like its predecessor, picks up nine years after the previous film, here rejoining its Franco-American couple, Céline (Julie Delpy) and Jesse (Ethan Hawke), as they struggle to live up to the impossibly romantic promise of Sunset’s ending. These lovers, in whose company we had previously spent almost as much time as they themselves had, are now a fair ways into something far more weighty, intimate, and treacherous: a long-term relationship. To give any more of a synopsis would be unfair to those (like myself) who have tried to remain as innocent as possible of the pair’s exact circumstances ahead of this movie. To recognise the felt stakes in revealing what became of these characters is to recognise something of the extraordinary challenge Linklater and his collaborators face with this film. I had almost forgotten until recently the huge trepidation I experienced upon hearing news of the first planned sequel, but last September’s announcement that a third had been shot quietly in Greece over the Summer brought the same nervousness rushing back. Revisiting beloved material is always a risk, but the particular qualities of this series pose special problems. These films have always been not just romances but also about romance as a concept - thanks both to Céline and Jesse’s endlessly meandering discourses on the topic, and to their very premises. Sunrise offered its couple an achingly precarious glimpse of something like love, and Sunset’s main subject was the fallout from the sense of a promise left unfulfilled. Midnight is at its strongest as an entry in this series when it wrestles subtly but consciously with that legacy. Echoes of long-past conversations, or stories, or games from Vienna and Paris bubble up to thrill and wound in equal measure. Time (undoubtedly these films’ second most central theme) again comes to feel like the uninvited third member of this love triangle, here both via the challenge of a shared but unseen past, and in the pregnancy of Linklater’s long takes. These two aspects of the film are in fact inextricable: whereas in the earlier movies the lingering extended shots could permit equal parts spontaneity and momentum, here they more often offer a kind of suspense. Since Céline and Jesse now suddenly (for us) know each other so intimately, we come to realise that they have also sadly learned how to hurt each other most effortlessly, and we sense it may only be matter of time until they do so again, grievously - perhaps within one of those characteristic long takes that once implied a world to be explored, but now also have the power to hint at one closing in on them. For it gradually dawns that Midnight is, at heart, a realist take on a now seldom-attempted genre, the marital melodrama. And in a sense, it could not have been anything else: a descent into sometimes bitter conflict is the logical outcome of a romance pursued past the point at which so many love stories choose to end (an inimitable version of which Sunset enacted). To say that this also makes the film the most conventional - and plotted - of the three is not a slight, but it does get at something that ardent fans of the series may find troubling: despite all the richly layered continuities with its predecessors, and despite the intense pleasure of seeing Hawke and Delpy fall back into these roles with the ease of the possessed, some aspects of this installment do not feel quite like the Before films as we have come to know and, perhaps, love them. An obvious defence immediately suggests itself: given the radically altered circumstances of the characters of course this film would and should feel (not excessively, but significantly) different. If after one viewing I find myself both largely convinced by this argument and unwilling to entirely relinquish the criticism (more to follow in the Alternate Take), this could perhaps say more about my investment in the film series than the achievements of its latest entry. Despite minor reservations, there is no question that this is still emotionally thrilling, intellectually stimulating, greatly accomplished cinema. This review was published on July 01, 2013.